How do I download the photos to my computer? 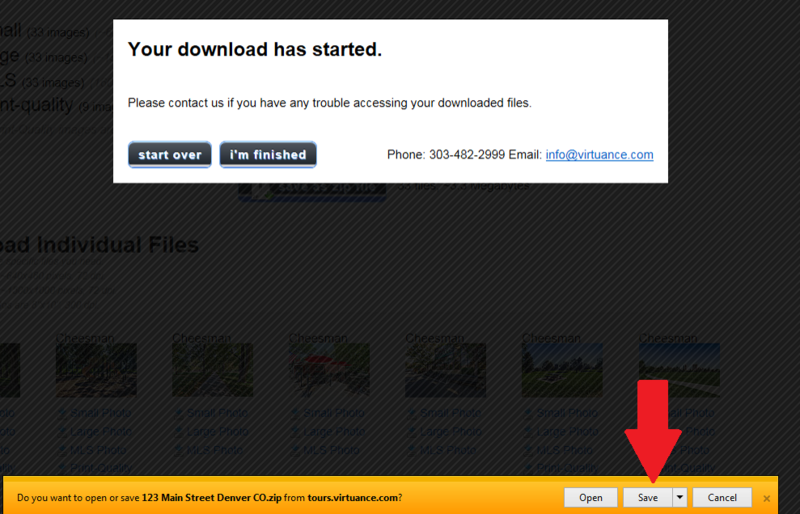 To download the images, click the client panel link in the tour publication email you received. An example of the email is below with an arrow pointing to the client panel link. Your Virtual Tour for 123 Main St Has Been Published. Please contact Virtuance Customer Service at 1-844-443-7325 ext 1 if you have any questions or need any assistance! How will I be notified once the photos are ready? You will receive an email which will include instructions for accessing your images and links to the tour and client panel. How do I add property information to my virtual tour? To edit the Tour Description, click the client panel link within the tour publication email you received, or click on “My Account” while logged into www.virtuance.com to select the tour you’d like to edit. Heading 2 is a great place to add any extra descriptors you would like on the main page of the tour. For example, below we’ve added “4 bed/4 bath/Loft” to the Heading 2. Heading 3 or the Tour Title will display in the browser title bar only. When we add “Beautiful Mountain Home” to this Tour Title, you’ll see that it shows up in the browser tab. This is a great way to improve Search Engine Optimization, or the ability for search engines to find your virtual tour. and finally, for extra space, you can scroll to below the MUSIC option and put a larger description of the property in the Description box. and as always, after making any changes to your tour, scroll to the bottom of the page, below the box for Statistics Emails and click SAVE! How do I change the music on my tour? To edit the music on the tour, click the client panel link from the tour publication email you received, or click on “My Account” while logged into www.virtuance.com to select the tour you’d like to edit. Once you are in the Client Panel, You can change the music options in the SETTINGS tab, by scrolling down to the Music options below the Tour Title option. You can listen to the music options to find the one that best meets your needs. To listen to the music selections, highlight one of the songs, and press the Play button (the triangle). To stop your music, select the Stop button (the square). Once you have chosen a song that you would like to use, highlight the desired choice and scroll down to click on the save button, below the Statistics Email box. How do I change the order of the images in my tour? To access the IMAGE ORDER on the tour, click the client panel link in the tour publication email you received, or click on “My Account” while logged into www.virtuance.com to select the tour you’d like to edit. Click on the IMAGE ORDER tab. You will see all of your images in a gallery view. To rearrange the order, click on the image you want to move and drag it to the order position you prefer within the image gallery. All of your changes will save automatically! When you’ve sold a listing or no longer want to market it, you may want to deactivate the tour – meaning it will no longer be available online. To deactivate the tour, click the client panel link in the tour publication email you received, or click on “My Account” while logged into www.virtuance.com to select the tour you’d like to edit. On the main SETTINGS tab, you should see a button that says DEACTIVATE TOUR. This will deactivate the link for your tour making it unviewable. To REACTIVATE a tour, please call Virtuance Customer Service at 1-844-443-7325 ext. 1! How do I see all of my virtual tours in one place? The “All My Tours” link is a link that allows internet users to see all of the active listings you have. It is great way to easily show clients or prospects all of your listings. Many of our clients choose to include this link in their email signatures or as part of email marketing campaigns. To access this link, click on the client panel link in the Tour Publication Email you received, or click on “My Account” while logged into www.virtuance.com to select the tour you’d like to edit. Scroll all the way to bottom of the browser page. You will see LINK TO ALL MY TOURS. Click on WEB PAGE LINK and a new browser tab will open. Within this new window, you will see a link to all of the active Virtual Tours you have marketed with Virtuance. To copy the link and add to your marketing materials, right click the URL address in the URL bar. Click copy, and you will be able to now post the URL in your marketing materials. This will allow potential buyers to access all of your virtual tours within one link! How do I access and edit all of my tours? You will immediately see a link to all of your tours. When you click on the link, you’ll be able to choose which tour you’d like to view or edit. How do I hide certain images on my tour? To access the IMAGE SETTINGS on the tour, click on the client panel link in the Tour Publication Email you received, or click on “My Account” while logged into www.virtuance.com to select the tour you’d like to edit. Click on the IMAGE SETTINGS tab. Next to each image, there are three options. To hide an image, click on NEVER VISIBLE and the image will only be visible to you in your client panel but not to anyone viewing the tour. Click on the IMAGE SETTINGS tab. To the right of the image, there are two text fields. The smaller one on top is for the image name. The larger one on bottom can be used to enter a caption for the image which will show on the tour. How do I update the MLS number on my tour? To add or update the MLS number on your tour, click on the client panel link in the Tour Publication Email you received, or click on “My Account” while logged into www.virtuance.com to select the tour you’d like to edit. Within the client panel, under the settings tab, you will see a place to choose the MLS service and input the MLS number. It is located below the music choices for your tour. Choose Your MLS service from the list provided. Enter your MLS Number in the line indicated below. MAKE SURE TO SCROLL TO THE BOTTOM OF THE PAGE (BELOW THE STATISTICS OPTION) AND CLICK SAVE. Once you have chosen the MLS Service and input the MLS number, our system will link the tour to the MLS Listing if this is allowed by your MLS service. Please check with MLS Service Provider or ask a Virtuance Client Service Specialist if this is available in your area. How do I upload my photos to MLS? Do you upload the photos to MLS for me? Most MLS systems and Realtor.com allow us to automatically link your virtual tour to your active listing as long as the MLS number is provided at the time of order or is updated afterwards in the client panel. What if I dont have the MLS number when I place the order? If you do not have an MLS number when placing your order, you’ll have the ability to add the MLS number via your client panel once the tour has been delivered to you. We use this MLS number to make sure that your virtual tour is accessible directly from the listing on MLS. When can I expect my virtual tour and photos to be on Realtor.com? Your virtual tour and photos will be uploaded to Realtor.com as soon as you provide us with your MLS number after the tour has been delivered. It can sometimes take several hours for the listing to appear on Realtor.com after we’ve sent them the information. What is a zip file and how do I open it in order to see my images? Zip files are simply a fancy name for a folder that contains multiple files within one downloadable file. In order to view the individual images within the zip file, you’ll need to unzip the file by right clicking on it and choosing ‘unzip files’ or ‘extract files’ depending upon what type of computer you are using. What is the difference between branded, unbranded, and simple layouts? A Branded Tour includes your contact information such as name, phone, email, and website. Branded tours also show your logo and headshot if you’ve uploaded them in the ‘My Account’ section of our website. Check with your MLS provider to see if they allow you to upload a branded tour to the MLS. An Unbranded Tour does not include any contact information, but still includes property info, school and tabs, if applicable. Unbranded Tours are IDX compliant, and therefore, they are suitable for uploading to any MLS. A Simple Layout Tour does not include any of your contact information nor property information. It simply contains images of the property in a slideshow. How do I access my QR Codes? To access the QR CODE, click on the client panel link from the tour publication email you received. Once you are in the client panel, scroll down to the TOUR LINKS section. Within the Standard Links tab, there are links to a Branded Tour, Unbranded Tour and Simple Layout. Unbranded Tour: No agent branding is present. This IDX Compliant. Simple Layout: A slideshow of the images without any property information. Next to these links you will see the QR code symbol for each link. To access the QR Code, click directly on the QR code symbol and it will open the image in a separate browser window. You can save image of the QR code by right clicking directly on the image in the new tab, clicking SAVE IMAGE AS and saving to your computer. Once the image has been saved to your computer, you can use it for your marketing, such as in a brochure, property sign or on a website for the property. When mobile device users scan the code, it will take them directly to your virtual tour! What does it mean to embed a tour on my website and how do I do it? Embedding a tour right onto your website will allow the tour to show directly on your site as opposed to requiring that your website visitors click a link to get to the tour. To do so, click on ‘tour links’ on the right side of your client panel. Then click the tab called ‘Custom Links and Embedded Tours.’ Then follow the directions shown in the ‘Embeddable Tour’ section. This will require you to copy and paste code from the client panel onto your website.